"The Grid Parity Monitor" by ECLAREON analyzes competitiveness of the photovoltaic technology with retail electricity prices for commercial consumers. 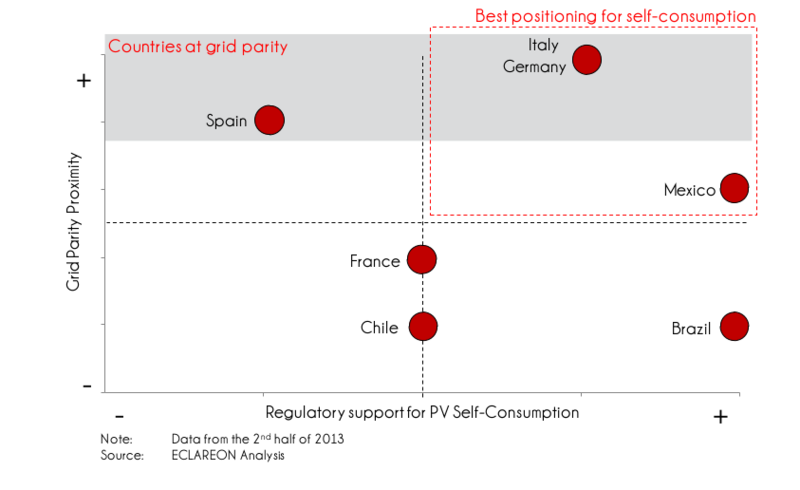 PV self-consumption finds a good positioning in Italy, Germany and Mexico. The results of the third issue of the study “PV Grid Parity Monitor”, carried out by the consulting firm ECLAREON, show that photovoltaic grid parity (the moment when PV LCOE becomes competitive with retail electricity prices, assuming that 100% of the electricity is self-consumed on-site) is an economic reality in the commercial segment in Germany, Italy, and Spain. The Grid Parity Monitor (GPM) analyzes competitiveness of the photovoltaic technology with retail electricity prices for commercial consumers and assesses local regulation for self-consumption in one sunny city of 7 different countries: Brazil, Chile, France, Germany, Italy, Mexico, and Spain. According to the study, in the last semester of 2013, the cost of PV generation as expressed by the LCOE (Levelized Cost of Electricity) in the commercial segment decreased in all of the cities analyzed. In spite of this improvement on PV economics, in most LatAm countries high installation prices still prevent PV technology from being competitive against grid electricity. Moreover, the majority of these countries have been facing retail electricity price decreases. In contrast, European countries such as Germany, Italy, and Spain have reached grid parity, with France as the only exception of the analyzed markets in the continent, as high irradiation levels and relatively low installation prices are offset by low electricity rates in the country. The GPM adds that the overall results for the commercial sector are not as positive as those achieved for the residential segment (refer to the residential GPM). In essence, the lower LCOE in the commercial segment, driven mainly by reduced system prices and other factors such as tax shield benefits, do not compensate for the much lower retail electricity rates available for commercial consumers. “In countries such as Brazil and Mexico, self-consumption is being encouraged by an effective regulatory mechanism, which allows prosumers to feed their excess generation into the grid for later consumption”, states David Pérez, partner of ECLAREON in charge of the study. On the other side of the spectrum, poor regulation can hinder the self-consumption market, as is the case of Spain, where the latest policy changes includes a fee on on-site self-consumption and allows for no compensation for the excess PV generation fed into the grid. The study remarks that PV grid parity by itself is no guarantee of market creation. PV self-consumption will only be fostered if grid parity is combined with governmental support. According to David Pérez, “in countries such as Italy and Germany, both at grid parity and with proper regulation, PV systems for self-consumption represent a viable, cost-effective, and sustainable power generation alternative”. He adds: “with subsidy-free generation from PV becoming a profitable alternative in many countries, the debate about the potential impact on revenues for DSO and tax collectors is gaining relevance”.